Traveling around any major city with a group can be a difficult process. With a Dallas charter bus rental from GOGO Charters, your Texas trip planning won’t have to be stressful. GOGO Charters offers top-quality charter buses for Dallas school trips, sporting events, weddings, corporate events, and even private vacation trips. Our group transportation services span all types of occasions to keep everything running smoothly. Our experienced team of rental experts are on standby at (214) 431-5792 to help you find the best charter bus or fleet of buses for your Dallas trip. GOGO Charters is your premier choice for group transportation solutions throughout the Dallas-Fort Worth area. We work with one of the largest nationwide networks of bus operators and drivers to provide groups of all sizes with both short- and long-distance transportation options. We’ve provided efficient charter bus services for groups traveling for a variety of occasions in the South Central United States and beyond. With thousands of completed trips across the country, GOGO Charters is equipped to handle your next Dallas trip, no matter the type or scale of event. Travel across The DFW Metroplex for your next group event with GOGO Charters behind the wheel. As the third most populous city in Texas after Houston and San Antonio, Dallas garners not only a fair amount of local traffic but it also attracts over 25 million out-of-town visitors each year. To help you travel through the busy city streets, GOGO Charters has access to comfortable and modern buses for locals and tourists alike. With our nationwide network of providers, we can accommodate your group coming from locations as close as Arlington or as far as Los Angeles or Atlanta. We have an experienced team of rental experts available around the clock to pair you with the best bus and professional driver for your Dallas trip. The charter buses in our network include models ranging in size and capacity to meet the needs of every group. Minibuses come in a variety of sizes and are suitable for small or medium-sized groups traveling for events like family vacations at Dallas’ top attractions or corporate events at the Hutchison Convention Center. These compact yet versatile buses are perfect for groups of 18 passengers to 35 passengers, and anything in between. If you’re traveling with a big group for a large-scale event, a full-sized charter bus can fit up to 56 passengers, comfortably shuttling everyone around for your Dallas sports trip or school field trip. Different models can include additional amenities to make your Dallas group trip as comfortable as possible. Beat the Texas heat with climate-controlled cabins, relax in reclining seats, stay entertained with entertainment systems and WiFi, and skip emergency pit stops with onboard restrooms. From the Sixth Floor Museum to the Dallas Arboretum & Botanical Gardens, the Big D is filled with learning opportunities for students of all ages. Rather than making students endure the Dallas heat on an uncomfortable, traditional school bus, upgrade everyone’s ride with a modern charter bus. Not only will students be more comfortable during their field trip, but they’ll also be safe and sound with a professional, certified driver behind the wheel. Students can stay entertained with onboard WiFi and televisions, while chaperones can rest easy knowing that professionals are handling the roads. Along with special field trips to local Dallas learning centers, charter buses are the best transportation option taking academic trips out of town. Texas is home to several large universities that thousands of students call home. Whether you’re an educator planning a college tour for high school seniors or you’re a group of friends organizing a tour together, renting a charter bus from GOGO Charters will ensure you can freely explore campuses on your own time. Tour local public schools like UT Dallas, travel to Austin to explore Longhorn stomping grounds, or head over to College Station to tour Texas A&M, the second largest university in the country. With GOGO Charters, you’ll have a driver who’s dedicated to your college tour group’s unique itinerary. Take all the time you need at each campus or visit multiple campuses within one trip. GOGO Charters has you covered from beginning to end. As the second most-visited city in Texas, Dallas brings in visitors for private trips of all types. With its world-class restaurants, premier lodging, arts and entertainment opportunities, and Texas charm, Dallas is a great location for your next private trip. Plan a group vacation or event like a family reunion with personalized transportation from GOGO Charters. Rather than needing to organize a caravan and assigning family members to separate cars, a charter bus rental will allow your family to travel together the entire trip. You’ll have a local, professional driver available to shuttle your entire family to event centers like Southfork Ranch or even to the Dallas Zoo for a family-friendly day out. Dallas’s neighborhoods offer visitors an array of things to do on their travels. 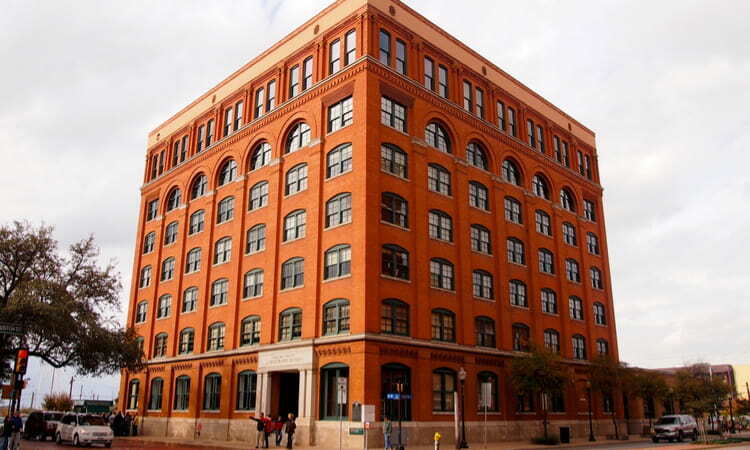 Split into around a dozen regions, Dallas has a diverse population and roster of attractions. Central Dallas offers every metropolitan convenience possible, while Northern Dallas is perfect for a quiet suburban atmosphere. If you’re an outdoor recreationist, you will find plenty to do in Southern Dallas’ neighborhoods at locations like Cedar Ridge Nature Preserve and the Trinity River Audubon Center. Downtown is the heart of Central Dallas and is the busiest neighborhood in the city. It’s the business and cultural hub of the Metroplex, encompassing smaller areas like the Dallas Arts District and the West End Historic District. Downtown Dallas is home to attractions like the Dallas World Aquarium, The Sixth Floor Museum, and popular local greenspace Klyde Warren Park. Deep Ellum is one of the most popular neighborhoods for hip nightlife and is at the center of Dallas’ music scene. 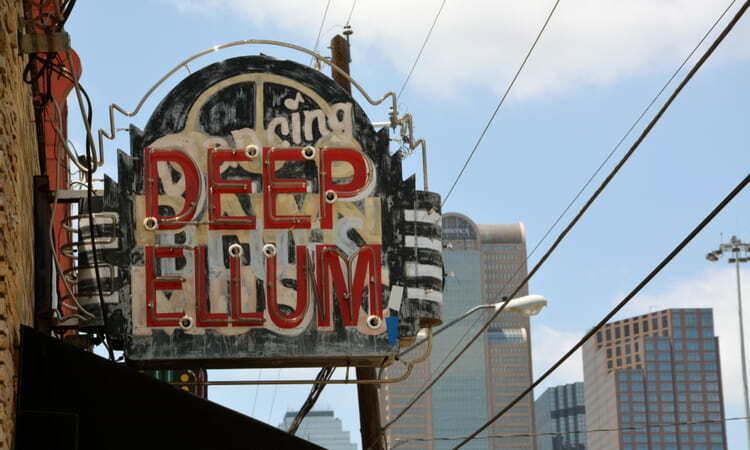 From country music to punk, Deep Ellum has live shows across all genres. Grab a few drinks at Double Wide Bar, have a bite to eat at Anvil Pub, and then head over to Dada Dallas for a local concert. Located just north of Downtown Dallas, Uptown is a lively, frequented district for trendy shopping and entertainment. Uptown Dallas includes attractions like the Perot Museum of Science and the American Airlines Center, home of the Dallas Mavericks and Dallas Stars. Grab dinner and drinks at Victory Park while you enjoy a Mavericks game on the big screen. North Oak Cliff is an upcoming South Dallas neighborhood that is hailed for its bohemian atmosphere and diverse population. The Dallas Zoo is located in North Oakcliff and the area is also home to historic landmarks like The Texas Theatre. The Bishop Arts District is located within North Oakcliff and is filled with vibrant street art, independent boutiques, and an array of restaurants. This affluent North Dallas neighborhood is located just south of Southern Methodist University. Highland Park offers some of the best high-end dining and shopping experiences in the city. Visitors looking for a luxe travel experience located away from the hustle and bustle of Downtown Dallas will love Highland Park. As one of the biggest cities in the region, Dallas is among the best locations in the country to host large-scale business events. From industry trade shows to conferences and conventions, Dallas is the perfect destination for business ventures of all scales. GOGO Charters has provided group transportation services for various types of business events. Reserve sleek minibuses to shuttle important clients from DFW Airport to lodging arrangements anywhere in the city. If you’re organizing or attending a big event at the Kay Bailey Hutchison Convention Center, renting a 56-passenger coach bus will streamline attendee arrivals and departure. Work-related events don’t always need to be strictly business. Team-building events and social gatherings like holiday parties and banquets are important of a company atmosphere as well. If you’re having a special company event, a minibus or custom fleet of minibuses will ensure all your employees enjoy themselves the entire night. Plan a holiday party for your entire company at STIRR in Deep Ellum and leave the transportation up to GOGO Charters. Weddings have so many moving parts for organizers and the bride and groom to worry about. Don’t let transportation be one of your many worries while wedding planning. GOGO Charters has handled the transportation for large, lavish weddings, as well as intimate, smaller services. Central Dallas’ neighborhoods like Downtown, Uptown, and Deep Ellum are notorious for lack of parking, especially during peak travel season and bustling business days. Popular venues like Tower Club and the Room on Main are in the middle of Dallas’ busiest neighborhoods. This can pose a problem for couples with a long guest list. Parking may be limited, causing guests to struggle to park in a timely fashion before your service. A GOGO Charters Dallas wedding shuttle will pick up guests at a designated location and drop everyone off at the venue in a timely fashion. When you reserve wedding shuttle transportation with us, you’ll be able to choose from modern and sleek charter buses to fit the beautiful theme of your ceremony or reception. Your guests will travel in complete comfort in climate-controlled cabins with entertainment systems and amenities to get the celebration started early. After the reception is over, everyone will be safely shuttled to their lodging arrangements or designated dropoff spots. 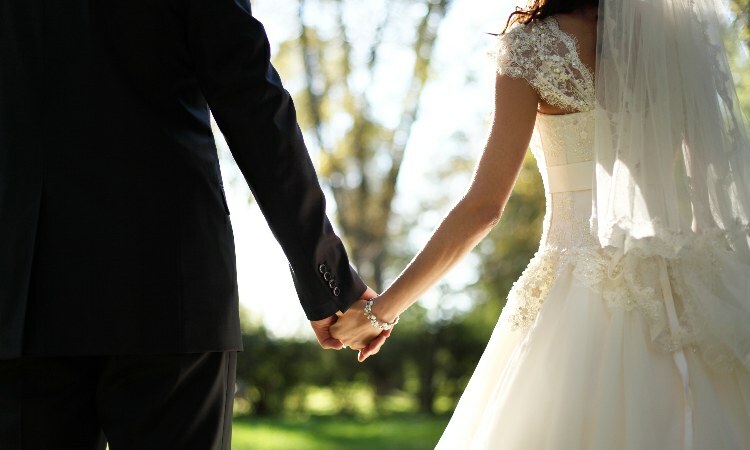 GOGO Charters has transportation solutions for every step in your wedding. Plan the ultimate bachelor or bachelorette party in Dallas with a private minibus to transport your group of friends around for the night. Enjoy some of the best nightlife in Dallas for your last hurrah before tying the knot. Every member of your party group will be able to live up the night as much as possible. You’ll have a built-in designated driver with a GOGO Charters minibus rental as you hop between rooftop bars in Downtown Dallas or local breweries in Deep Ellum. The Dallas area is home to six professional sports teams, each with their own dedicated following. Fans of the Dallas Cowboys won’t have to worry about how they’ll transport their entire group to AT&T Stadium in Arlington for a game. Or if you’re a group of Texas Rangers fans, getting to Globe Life Park will be simplified with a charter bus rental. Splitting up into multiple cars for a tailgate or pre-game isn’t ideal. This adds to an already hectic parking situation while trying to find enough spots to accommodate your caravan. There will be plenty of space onboard your motorcoach to store tailgating gear like tents, coolers, chairs, and anything else you’ll need. If you’re a fan of local collegiate teams like the UTA Mavericks, TCU Horned Frogs or the UNT Mean Green, you’ll never have to miss a game with GOGO Charters! Travel to support your favorite college team, even if they’re playing an away game. Dallas fans of the Texas Longhorns or Texas A&M Aggies can also rely on us for group transportation to Austin and College Station for big games. Dallas plays host to large-scale cultural festivals, sporting events, and community-wide fairs every year. Hundreds of thousands of locals attend these events annually and out of town guests frequently travel into Dallas as well. 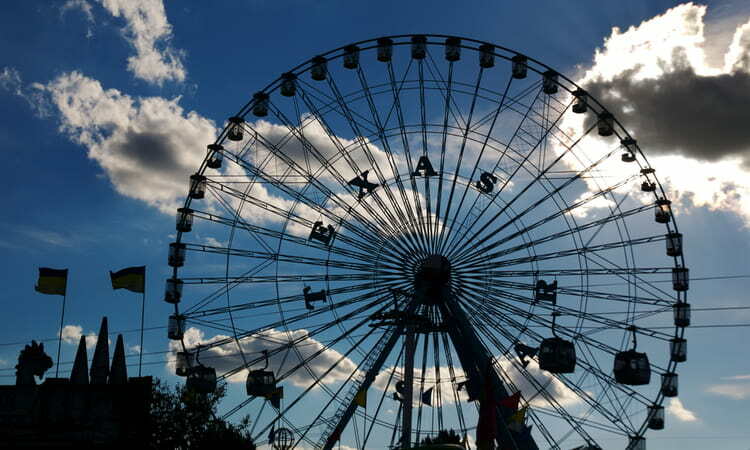 The Texas State Fair is one of the oldest and busiest fairs in the nation, attracting over 2 million people each year since it began in 1886. As one of the biggest rivalry games in collegiate football, the Oklahoma Sooners and Texas Longhorns duke it out every year during the Texas State Fair. Explore DFW’s local art and music scene at this 3-day festival that celebrates creativity and community across North Texas. The DFW Metroplex is the only location to host two PGA Tour stops. The AT&T Byron Nelson usually precedes the Charles Schwab Challenge, which is held in Fort Worth. This annual festival focuses on appreciating and advancing film within the Dallas community. The festival generally spans about a week and includes special screenings, competitions, and more. How Much Does a Bus Rental in Dallas Cost? Calculating the cost of your charter bus rental in Dallas will depend on multiple factors. This includes but is not limited to the time of year, the size of your group, trip distance, and duration of the trip. When you have an itinerary for your trip and a headcount for passengers, our rental representatives will be able to provide you with a quick, no-hassle quote. GOGO Charters is your top choice for quality, reliable charter bus rentals in Dallas and the surrounding area. We’re here 24/7 to assist you in organizing the best transportation solutions for your event around DFW. We also service most major cities nationwide, so you’ll have top-notch group transportation services in neighboring Oklahoma, New Mexico, and beyond. Call us at (214) 431-5792 to get your free quote today!